As I watched all the episodes of the Classic Doctor Who show, I wrote my thoughts down. Then, when I was done, I mulled over going ahead and watching the newer stuff. That meant watching The Movie, and Paul McGann's Doctor. So, I did. Had to buy it, sight unseen. Eh. McGann himself was okay, but I didn't like The Doctor being involved with a companion. Sure, there's no question that The Doctor and Ramona had a thing going on, but that was off-screen. The show wasn't about that, it was about Adventures In Time And Space. I loved that Sylvester McCoy opened the movie as The Doctor. He never explained how he had destroyed Skaros but then was able to travel to Skaros and get The Master's body. And, they should have had Anthony Ainley reprise the role of The Master for the opening. Or at least used his image from clips and paid him for that. Nothing wrong with Eric Roberts' portrayal. And, after watching The Movie, I watched the other episodes (the newer ones, from 2005 on) and specials. And Webisodes. Yeah, it's okay. But, there are things I didn't like. And, me being me, I'm gonna tell you what I didn't like. I'll assume you have seen the newer episodes, and specials, and webisodes, up to and including Peter Capaldi's Doctor asking Clara if she knew how to fly the TARDIS. The Doctor and companions being more than simple companions? Don't like it. Maybe that's why I really like the dynamic with The Doctor and Donna. She is truly a friend of The Doctor. The relationship was more like The Doctor (2.0) and Jamie. That worked well. And The Doctor and Donna worked well. Rose? Not a fan. Even her surprise appearances don't thrill me. The Brigadier's occasional returns were treats. Rose's? Not so much. Rose should've ended up with Mickey. Not the early Mickey, but the later Mickey. Martha? Good companion, but the whole "feelings" thing was what ruined that. Her ending up with Mickey was good, for both of them. I'd like to see them return. Donna? Love her. She's up there with Sarah Jane Smith and Jamie McCrimmon in the whole hierarchy of companions. Amy and Rory? Yeah, they're good. But the best thing to come out of their time with The Doctor was *SPOILERS* River Song. River Song? Yeah. More River Song. Somehow. That relationship with The Doctor worked. That's wasn't a young, silly girl having a crush on the Time Lord (Rose, Martha, etc), it was a real relationship that stood the test of Time And Space. Clara? She's alright. Let's see how they wrap all that up. But so far, they've done okay with here. Ah, but the show isn't called The Companions. It's Doctor Who. And, The Doctor is the star, or stars, of the show. Paul McGann, I though was just okay. Least favorite Doctor for some time. His later surprise appearance in The Night of the Doctor brought him up in my eyes a bit. I want to see more of that Doctor. Christopher Eccleston was okay. About the time I got used to him, he bailed on he show. Shoulda stuck around for three years, at least. David Tennant? Yeah, he was alright. Probably coulda played The Doctor for a lot longer. Overall, liked him. Not Peter Davison or Patrick Troughton liked him. But, he was fine. Matt Smith? His biggest problem was the scripts. The whole "Oh, I know what to do because myself from the future suddenly appeared and told me what to do" got a little old. It's called the TARDIS, not the Deus Ex Machina. Oh, and John Hurt? Yeah. He was alright. Particularly when he was keeping Matt Smith's and David Tennant's Doctors in line, he reminded me of William Hartnell keeping Jon Pertwee's and Patrick Troughton's Doctors in line. Oh, yeah. The villains. Some of the classic villains returned, and it was hit and miss. The Autons? They did those right. Those were truly the Autons chasing Rose and The Doctor around when the new series launched. With better makeup and effects. That gave me hope for the new series. The Sontarans? I like what they did with them. Nothing. They are true to form. Better makeup, just as with the Autons. The Sontarans are definitely the same villains as in the old show. And that's a good thing. The Cybermen? Nope. Well, not the ones from the alternate universe. They did have the ones from Mondas, the real ones, appear later. I think. They looked kinda like the original Cybermen. So, I'll just tell myself those are the real Cybermen and be happy. Daleks? Nope. Daleks can't fly. That ruined everything. It was a shock when they could elevate up stairs when taking on The Doctor (7.0). Now, they can suddenly fly? Nope. That's wrong. The Master? He's been okay. Season Eight featured too much of The Master. When they scaled it back, it was wonderful to see him appear. Roger Delgado was fantastic, as was Anthony Ainley. I would like to have seen more of Derek Jacobi as The Master, but John Simm was good in the role. I want to see more of The Master. Once a season. Maybe twice, to throw us off. New villains? Well, the Weeping Angels were kinda neat. But those fart aliens? Americans, I suppose. None of the other ones stand out, all these weeks after finishing the new series. But, overall? Yeah, the new series is okay. 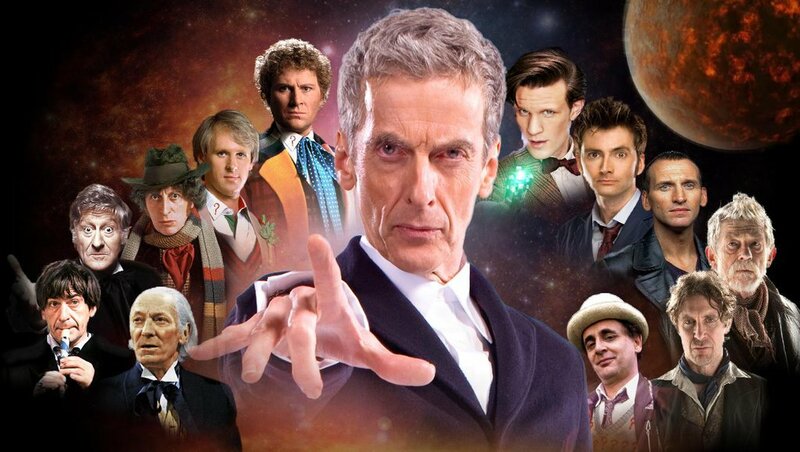 Maybe Peter Capaldi's Doctor will be a return to the Classic series. More actual story and less generic blowing stuff up. I'm looking forward to the 8th season of the new series when it returns in August. So, maybe I do like the new series after all. In a way, Rory and Amy is them getting the Rose and Mickey relationship right and having them stick together. So are you going to watch the spinoff Torchwood? SarahK and I just started that. If you're going to watch Torchwood, check any prudish sensibilities at the door. LOTS of sexual content and innuendo, most of it gratuitous. That said, the show's pretty good despite all of that. As with any episodic show, a lot of hit-and-miss in seasons 1 and 2. The third and fourth series were each short, single-story arcs, and have more of a "24" kind of vibe going on because of it, where the tension keeps rising and the stakes get higher with each twist.